The MADS box genes SUPPRESSOR OF OVEREXPRESSION OF CONSTANS1 (SOC1) and FRUITFULL (FUL) are widely known to be involved in the determination of flowering time and the transition from vegetative to reproductive meristem identity in A. thaliana and many other plant species. Analog to the induction of SOC1 and FUL, double mutants in Arabidopsis revealed both secondary cell wall and wood formation. We tested a putative influence of the overexpression of both genes onto growth and plant habitus in the perennial genus Populus. Two different poplar hybrid clones were transformed with SOC1 from A. thaliana (AtSOC1) and FUL from Sinapis alba (SaFUL). Both genes were under the control of the CaMV-35S promoter to induce constitutive overexpression. Regenerated single and double transgenic lines were transferred to the glasshouse and cultivated for up to two vegetation periods. Parallel overexpression of both genes led to plants with a significantly restricted plant growth compared to both untransformed controls and single transgenic plants. Extreme phenotypes also exhibit a different overall habitus of plants and leaf morphology. 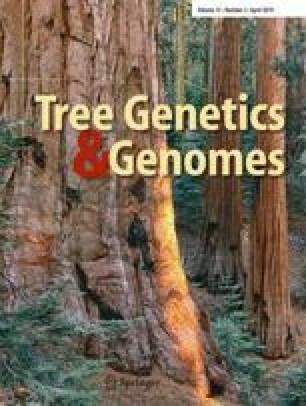 Thus, both genes seem to be involved in plant habitus and biomass formation in poplar. This study confirms the hypothesis that the two MADS box genes SOC1 and FUL are not only part of reproductive meristem regulation but also involved in vegetative meristem growth. In the next step, downregulation of all SOC1 and FUL genes in poplar by genome editing could lead to increased plant growth and biomass formation. The online version of this article ( https://doi.org/10.1007/s11295-019-1326-9) contains supplementary material, which is available to authorized users. We are grateful to Siegbert Melzer (Christian-Albrechts-Universität, Kiel, Germany) for providing the SaFUL and AtFUL overexpression transformation vectors. Thanks to Olaf Polak and Susanne Jelkmann for outstanding laboratory work. Thanks to Gundel Wiemann, Monika Spauszus, Matthias Hunger, Rainer Ebbinghaus, and Dr. Wolfgang Graf for technical assistance in the glasshouse as well as to Jennifer Lüneburg, Denise Lehnhardt, Doris Ebbinghaus, Anke Schellhorn, and Angelika Worm for their support in the laboratory. This work was part of the joint project “PopMass,” funded by the German Federal Ministry of Education and Research (BMBF) under the funding number 0315972A. The responsibility for the content rests with the authors. Primer sequences used in this study can be found in Online Resource 2.